Vulnerable Medium: The young editors of the Otago Labour Regional Council's newspaper, Caucus, could only reach their readership through the expensive processes of the printing press. This gave their publisher, by virtue of its control of the purse-strings, the ability to shut the paper down if it strayed too far in the direction of controversy. That was in the early 1980s. Today's political bloggers cannot be silenced so easily - or so they thought. THE FIRST ISSUE of Caucus appeared in September 1982 and the last in April 1983. The third (and final) issue featured a highly critical opinion-piece entitled: “Yes – I’m the Great Pretender: A Socialist Critique of David Lange.” Since Lange had only been Labour’s Leader since February 1983, the editors’ decision to publish the critique in a Labour Party newspaper was either exceptionally brave or extremely foolish. The newspaper’s publisher, the Otago Regional Council of the Labour Party, did not have to wait long for Lange’s reaction. At its next meeting the Labour Leader turned up unannounced, asked the man on the door to point out the author of the offending article, took a seat beside him, removed a copy of Caucus No. 3 from his briefcase and tore it into little pieces. The Port Chalmers Branch of the Labour Party went one better than their leader. 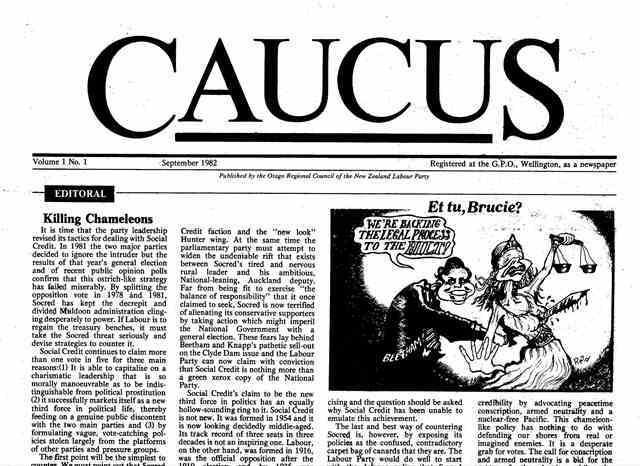 After passing a motion of censure in the newspaper’s editors, all 200 of their branch’s copies of Caucus were burned. A few days later, Caucus’s two young editors were asked to drive Labour’s then Transport spokesperson, Richard Prebble, to Oamaru for a “Save Rail” rally. Mr Prebble took advantage of his captive audience to deliver a stern homily on party discipline. Thirty years later, supporters of internal Labour Party democracy are facing many important differences from the early 1980s, but also some startling continuities. The most obvious difference between 1982 and 2012 is the size of the party. Labour’s current membership is reportedly at an historic low, but thirty years ago it was at an all-time high. Putting to one side the trade unions’ affiliated membership, Labour’s branch membership in the early 1980s numbered more than 80,000. The very fact that a regional council possessed sufficient funds to publish its own newspaper points not only to the sheer scale, but also the organisational vitality, of what was indisputably a mass political movement. It was also a time before the invention of the World Wide Web. To reach a mass audience in the early 1980s required the assistance of a printing-press – and that cost money. Having strayed beyond the paths of acceptable opinion, Caucus very quickly discovered that he who pays the piper calls the tune. Not that the Otago Regional Council would ever censor its own newspaper – perish the thought! It was simply a matter of budget priorities, which were deemed, in the weeks following the notorious Caucus No. 3, to NOT include a regional party newspaper. 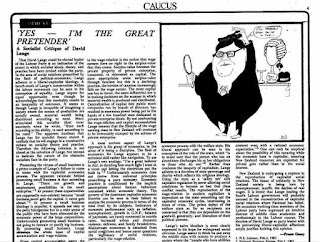 The Offending Article: Said Richard Prebble to the editors of Caucus: "Your first mistake was to assume that the Labour Party is a democracy." In 2012 no party subsidy is required for Labour members and supporters to speak to one another. The World Wide Web and the “blogs” it has spawned have relocated the no-holds-barred political debate which the young editors of Caucus had so courageously attempted to encourage in 1982-83 to “cyberspace” – a realm well beyond the financial veto of the Labour Party’s regional and national hierarchies. Foremost among New Zealand’s Labour-focused blogs is The Standard (its name inspired by Labour’s nationwide newspaper of the 1940s and 50s) with a readership in the hundreds-of-thousands. Like Caucus, The Standard has earned the wrath of the party hierarchy (and especially Labour’s parliamentary caucus) for its outspoken criticism of Labour’s leader – criticism that’s only grown louder following the demotion of Mr Shearer’s purported challenger, David Cunliffe. It is at this point that we encounter some powerful continuities with the Labour Party of thirty years ago. For it would seem that those participating in The Standard have made the same “mistake” as the editors of Caucus: that of assuming the Labour Party to be a democracy. Stung by The Standard’s continued criticism of Mr Shearer, a “senior Labour MP” is reportedly seeking to limit the ability of Labour members to post articles and/or offer commentary on any blog operating outside the effective editorial control of the party organisation. Even more damning, from the perspective of a generation raised on the ethical protocols of the Web, information supplied in confidence to the Labour Caucus controlled blogsite, Red Alert, is allegedly being used to identify Labour members participating either anonymously or pseudonymously on The Standard and other blogs critical of Labour’s performance. It is too soon to predict the outcome of this latest attempt to curb democratic debate within the Labour Party. It is, however, possible to draw some lessons from the fate of Caucus. Prophetically, the author of “Yes – I’m the Great Pretender” wrote: “It is ironic that Lange leading the fourth Labour government will probably succeed in the reconstruction of capitalist relations where National has failed.” How very different Labour – and New Zealand – might have been had such prophetic insights been debated instead of suppressed. Only a democratic Labour Party can re-construct a democratic New Zealand. This essay was originally published in The Press of Tuesday, 11 December 2012. There is no need to be coy, Clare Curran's grubby little attempted(?) vendetta against one of her local party members is now more or less accepted fact in the absence of any denial whatsoever. However which you want to look at it, the spectacle of a significant portion of the membership in open warfare with the controlling caucus clique is incredible. Bryce Edwards notes that the Labour party is now a husk, a cadre party, where "...an elite of parliamentarians and parliamentary staff... ...have almost total control over the image, policy, ideologies and activities of the party..." Given the behaviour of the caucus gang of thirteen I am of the view that the cabal that controls the party has convinced itself that it doesn't need a broad membership, it just needs to control the electoral recognition of the Labour logo. After all, under MMP the 2011 vote could halve and all the entrenched parasites like Mallard would still be safe, insulated in the last resort by the party list. Labour as a political party has been reduced to a branding vehicle to support corporate political careerists, the red political Vodafone to the blue political Telecom. A dysfunctional Labour appears to be drifting to power on the back of the disinterested incompetence and cronyism of the current National government. What sort of government it will make - at war with its membership, dominated by tired political hacks dedicated only to their own sinecures and having no real ideological coherence - God only knows. But in all probability the appalling misgovernment of the New Zealand people that started in 1975 will continue it's unbroken sequence. You comment that the two people producing the paper drove Prebble from Dunedin to Oamaru. Given that Labour were then in opposition it would mean, I assume, that they were providing the car. What a glorious opportunity they missed. They could have turned left off the main road and gone 5 km or so down one of the relatively deserted side roads along the route. They could have just pulled up, announced that the car was a democracy and that the majority vote was to stay there for a few hours. Richard Prebble was of course at liberty to start walking. I don't think I would have been game to try it of course but I can imagine some braver soul doing so. "Foremost among New Zealand’s Labour-focused blogs is The Standard with a readership in the hundreds-of-thousands." I... really doubt that. According to its public stat count, The Standard had 192,579 visits last month. But that is across roughly two hundreds posts and includes the very many users that would have visited multiple times to check and leave comments, and who obviously can't be counted as distinct individual users every time they access the site. I think it matters because over-estimate the reach of blogs can not only go to our heads but also skew our perception of the media environment in which we work, and the size of the public we can influence politically. It may be time to let Labour go. It’s a powerful name but the left’s attachment to it leads to wasted effort. The left can’t get the Labour Party back. A party of entrenched cliques and cabals won’t surrender without the kind of campaign that sullies everyone who takes part in it – not a victory worth having or a party anyone would want to vote for. If the endless recession has done nothing else, it has shown the public that Labour’s careerists represent nobody but themselves. Dismal results tell their own story. There are electoral opportunities for democrats but the left can’t take them until it accepts that the grand old name must go the way of ‘Liberal’ and ‘Reform’. +1 to what Anonymous wrote. The hollowing out of the Labour Party as a mass membership organisation has many similarities to Labour in the UK. There's only so long people who are told not to exercise their voice will also display loyalty. Before too long the third option, exit, becomes more attractive, and the party finds itself short of door knockers and leaflet deliverers. Then it becomes dependent on funds from the rich, who rarely have policy goals that align with those that Labour was brought into existence to assist. this is the same Clare Curran who attacked the Greens before the last election for 'taking votes' from Labour. Is she genuinely anti democratic? or just the stupidest MP to ever wear the red rosette in New Zealand? I think Alwyn very correct, we all need to be braver with our "leaders" and demonstrate to them the result of their attitudes in practical terms. Years back I remember an event when Moore turned up at a Union meeting in Chch demanding election funds for the upcoming election. The local delegates rounded on him and told him in no uncertain terms that he did not share their principles and therefore to go forth. We need more of this. MPs become swelled with power and often take a holier than thou stance, and not just Labour MPs. If party members cannot freely voice their opinions, whether along the lines of party policy or not, but is tolerated only as a leaflet droppers, work donkeys, then forget we might as well be in Russia. What makes them right? Clare Curran should get off her high horse. Why doesn't David Shearer actually lead, and take control? And I haven't been a financial member of the Labour Party since the 1983 local body elections.In Lower hutt we had a dictator who was more interested in his mayoral ambitions, and denied activists like myself who stood on the ticket from promoting themselves in their local neighbourhoods. Then along came Lange, Douglas and Prebble - and the rest of the fish and chip brigade, and Labour has never been the same.In 1990 I voted New Labour in protest at the neo-liberals who believed in the trickle down theory, but in fact only urinated on their shoes.